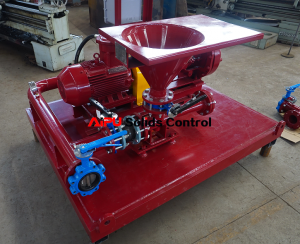 Jet mud mixer is a mud mixing equipment for drilling mud for oil & gas drilling, coal bed methan, horizontal directional drilling, diamond drilling, water well drilling, etc. 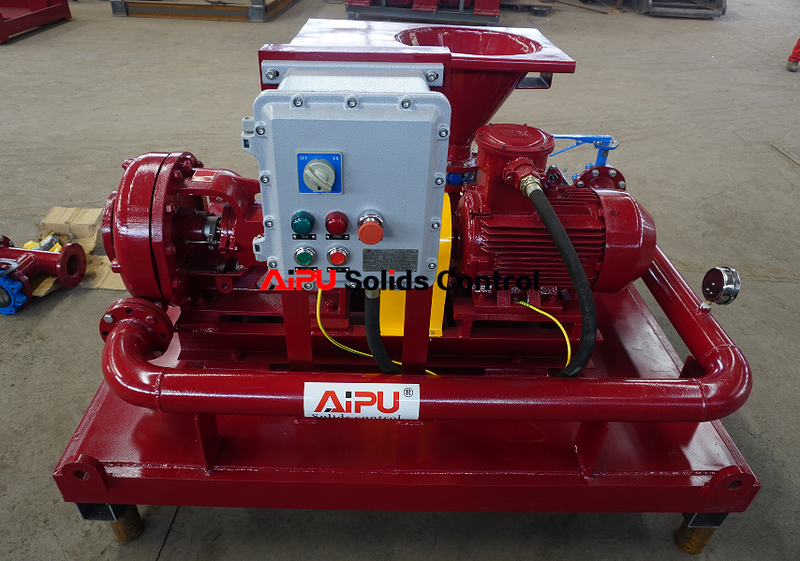 The mixer is a combination of centrifugal pump, mixing hopper, pipeline and skid. The Australia client ordered 2 sets of jet mud mixer for coal bed methan drilling mud mixing, all electrical are IECEX certified for motor and control panel and wire arrangement as per AS/NZ 3000 standard for Australia regulation. The client ordered a complete sets of spare parts also for flexible arrange and maintainance on jobsite. 4 inch venturi type mixing hopper with butterfly valve between hopper and venturi T connections. There is one butterfly valve each inlet and outlet for 4 inch size to connect with pipeline for centrifugal pump and mixed mud discharge. 11 kw motor for 4×3 size centrifugal pump with 11 inch impeller to reach mud flow capacity 200GPM. The centrifugal pump is mechanical seal with interchargeable parts with mission mugnum pump. The motor is IECEX certified for Australia drilling site. Pipeline arrangement between mixing hopper and centrifugal pump with butter fly valves. There is a T outlet to allow mixed mud discharge to some other tanks. Electrical control panel for IECEX certified, IP65 protection level, emergency stop button. The control panel fit on panel support frame and bolted on skid beside mixing hopper for convenient control. Jet mud mixer can be fit on a skid or arrange separated on mud tank. Many clients may lay centrifugal pumps on tank skid and mixing hopper on tank top for mixing heavy materials. The separate design may require clients order pump, hopper, valves, pipeline and build tank themselves or we can build a complete mixing tank as per request.